article Archives - Your One Stop Real Estate Website! Selling your Connecticut home does not have to be about compromises all the time! We have thought of you and came up with steps that could help you sell your house fast without having to give it away for next to nothing! My name is Deborah Laemmerhirt and part of my vision is to be a game changer of the real estate scene in this state. Who else can help you with the finest service than a bona fide resident of Connecticut? Welcome to our series of articles that will serve as your comprehensive guide to selling your home in CT fast. If you’re clueless about how the world of real estate selling works, this is the mini e-book you need to read. Do You Need a Realtorⓡ When Selling Your Home? If you're planning to put your home on the market, chances are you're also considering if you need the services of a Realtor® or if you're better off selling the home by yourself. Some home owners choose FSBO (or For Sale by Owner) because they want to save on the agent commission. I understand. The agent's commission amount to several thousands of dollars, money they can use on something else. What about the disadvantages? FSBO has several disadvantages. One is your home don't get listed on the MLS (multiple listing service), a tool where agents list all their properties for sale. Buyer agents find potential homes he can show his clients on the MLS. If your home is not listed, you miss all the potential clients. Another disadvantage of FSBO is you don't get the help from a professional agent. Home selling is a big task and a long journey. Without the assistance of a professional and reputable Realtor®, you could be making home selling mistakes which will put your home for a long time on the market. Take your time to weigh the options. The decision you make will significantly affect your home selling journey, so choose the one you will be comfortable doing for the next months. How Can a Realtor® Help Me Sell My Home Fast? Countless decisions await you the moment you decided to sell your CT waterfront home. Many of these will have a direct and significant impact on how successful your home selling will be. For your home to sell quickly, it needs to have the right price, be properly marketed, and well-presented. How can a Realtor® sell your home fast? Help you establish a fair market price for your CT lakefront home for sale. Your home’s price has the most significant impact on the success or failure of your home selling journey. If you price your home too high, it’s just going to sit on the market for months and soon the property will become stale. Having the right price is the key, and that’s one of the things I can assist you with. Using real estate tools like the CMA and MLS, I can help you come up with a price that’s agreeable to you but also right on the market value of the home. Provide advice on how you can maximize your home's aesthetics to be more appealing to buyers. Realtors® know what buyers want in a home. It comes with the years of working with people. I can walk into your home and tell you exactly what buyers will love and change. I give advice and suggestions on what to improve and upgrade in your property so buyers will find it more appealing. I also have an established network of contractors who can assist you in everything, from moving to deep cleaning, house repairs, plumbing works, painting works, roof repairs, interior designing and more. Your home will be prepped and staged so its best features are highlighted. According to the NAR Profiles of Home Buyers and Sellers 2017, 95% of home buyers use the internet to search for their next homes. If your lakefront home for sale in CT is not on any real estate portals or on the MLS, buyers will not find your home. A Realtor® will list your home on the MLS, post your home on the top real estate sites so it is visible for buyers, and brand it right so it will be easily seen by its market. I have a highly competent team to market your home online. They make sure that your home is listed on top real estate sites, social media, and other multimedia platforms. All these marketing tools increase your chance of being seen by the right market. Delivers convenience and better access to buyers. Buyers prefer immediate responses and if you happen to be busy and were delayed in replying to questions, the buyers will move on and find a new property. Your Realtor® is your liaison to the buyers, providing better access to your home information, answering questions and setting appointments. Having professional assistance is of immense help because it is convenient and less stressful for you. Your Realtor® can sell your waterfront real estate property in CT for its best price by presenting all documentation in a logical and professional manner. This may be a huge challenge for you as a seller because you have an emotional connection to the house. Any dislikes or feedback from the potential buyer may be construed negatively if directly mentioned to you as the seller and may be the reason for the cancellation of the negotiation. If you have a Realtor®, you have someone who’ll deal directly with the sellers without being offended. If you want to sell your CT home quickly, the assistance of a Realtor® is of immense importance. If you are wondering how to quickly sell your waterfront property in CT, one of the things you need to get right is your home's price. Yes, preparing your home, improving the curb appeal, making repairs, and updating its features will definitely help, but there's only so much that visual appeal can do. Your Connecticut house listing price will determine whether it will sell fast or stay on the market for months. You've probably seen many beautiful homes that got stale because they were overpriced. That's exactly what you want to avoid. All sellers want to sell fast and for the best price. How do you do that? There's no set formula for home pricing. It takes research. With the right information, you then set an estimated value for the home. You need to get the price right. These days, buyers are very smart. They know how to use the internet to search for properties which give them the best value for their money. They'll know if your lakefront property in CT's listing price is above its market value, and it will be constantly ignored until it expires. However, setting the price too low means leaving money on the table, and it will be a big loss for you. Here are the things you need to set the right price. Secure the help of a real estate expert. An experienced agent knows your market and has the right tools to find the information you need. He or she will prepare a list of comparables which will help you set the price. One of the common mistakes home sellers make is not conducting proper research before hiring a real estate agent. Your home in Connecticut is one, if not the biggest investment you will ever make. Why place it in the hands of someone you just met? Do your research. Ask for recommendations from people around you. Look up the local agents online and check their reviews. All these will give you a good idea of who the best agent is. Examine comparables. Comparables are homes that are comparable in size, style, and location with that of your own. These are the houses in CT that have sold recently in the past six months. Examining these comparables will tell you how much buyers are willing to pay for homes like yours. Don’t stop at sold comparables. Check out the active listings and pending sales. Active listings will tell you how your competition is going, and the value they’ve listed their homes for. Know the local real estate market. Is your local real estate market experiencing a buyer's market, a seller's market, or a neutral market? If you know the answer to this question, it will be easy for you to add a couple thousand or drop several thousand to the price so it will fit with the current market. Overpricing will turn off buyers, which may cause your property to get stale on the market. With the help and guidance of your listing agent, you can price your home for sale in Connecticut so that it’ll sell fast and for its best price. How Can I Make a Good First Impression on My Buyers? In real estate, the first impression is the only impression. You have only one chance to impress your potential buyer, so you have to make to make it count. It is a highly competitive market, and with the number of CT homes for sale available for buyers to choose from, if your home is not appealing, enticing and impressive, you'll find your property staying on the market longer than you want, or worse, getting stale. That's why it is important, no, crucial, that you pay attention to your home's details and ensure that your home shows well from the moment the buyer sets eyes on it. Buyers have the privilege to look and judge everything, and they definitely do that! From the landscape to the paint color, to the size of the drawers and the features of the home, nothing escapes the eyes of meticulous buyers. Clean, clean, clean! Buyers can see past old appliances, outdated wallpaper, and missing fence boards, but a messy house is totally unacceptable. Give your house a deep clean. Wash your windows, wipe down your appliances and counters, wash your carpet, mop the floor, etc. Or better yet, get it professionally cleaned. This will ensure your home sparkles. Make it spacious. Unless you have a magic wand, you cannot add space to your home. However, you can make it look bigger, brighter and more spacious by decluttering. By throwing away any unnecessary items and putting extra furniture in storage, you can make your home look larger than it is. Spruce up your curb appeal. Your home's curb appeal is the first thing buyers see when they come for a showing. It's important to make your curb appeal enticing enough for them to want to see more. One way to ensure your home's exterior is clean is to give it a good power wash. When done correctly, it can get rid of the years of dust and grime and make a huge difference. Power wash your driveway, the walls, the patio or deck. It makes your exterior look cleaner, newer, brighter and most importantly, well-maintained. Another way to increase the possibility of a sale is to make your home's curb appeal charming and inviting. Trim the grass, prune the hedges, and add some plants. Plants make a house feel more like a home, so be sure to add two to three potted blooms on your porch for that welcoming look. Make sure that your front garden is alive and thriving. If you have any trees in the front yard, make sure to remove the dead branches and dried leaves. Adding a nice welcome mat at the front door is a simple and easy way to boost your CT home for sale's curb appeal. Repair any minor issues and damages. As much as buyers love beautiful homes, they prefer move-in ready homes with minimal physical issues so they have less to worry about. Fix everything that needs repair, be it broken door knobs, leaky faucets, cracked tiles, etc. You want everything in the home to be in good working order. Paint. One of the easiest and cheapest ways to update your home's look is to paint it. It is amazing how a fresh coat of paint can instantly boost your home's appearance and make it look newer and well-maintained. Pick a neutral-toned paint color, which will make your home look bright and inviting. These simple steps will help make your CT lakefront property more impressive and enticing enough for buyers. What Can Staging Do to Sell My Home Fast? Thanks to reality television, people are already familiar with the concept of staging. Home staging is the process of preparing a home to sell by making the home appealing to its buyers. It is similar in many ways to product packaging, and is a fundamental step to selling fast and for top dollar. In the past, staging was optional. Now, it is a must for anybody trying to get their home sold. Why stage your CT luxury waterfront home? 1. Sell your home faster. According to a RESA study, staged homes sell 87% faster than unstaged ones. Unstaged homes stay on the market for 166 days, but after staging, they sell in 32 days. Buyers view staged homes as well-maintained and move-in ready, making it more desirable. 2. Sell your home for a better price. All that money you’ll spend on staging? It’ll pay off. 31% of buyer’s agents say staging increases a home’s value by 1-5% compared to homes that are non-staged. 3. Buyers visualize the property as theirs. 77% of buyer’s agents say that home staging makes it easier for buyers to think of the home as theirs in the future. 4. Make the house look stunning in photos. If you want the best photos for your marketing, both online and through flyers and brochures, stage the home! When your home looks like the ones on magazine covers, it becomes easier to market. Did you know that 96% of buyers search online, and the better your photos are, the higher chance you’ll have of selling the home? 5. Make rooms look bigger. Did you know that an empty room looks smaller? It is because there is no point of reference in the room that can make you think how small or big the space actually is. Staged homes, on the other hand, appear airy and spacious. “Pricing will get you in the game, but staging is going to bring you the offers. If people can’t imagine moving in the home, then they move on”. I completely agree with that, which is why I’ll be sharing with you a few tips on how to stage your waterfront home in CT so it can look more appealing to the buyers. After living in your house for many years, you have undoubtedly collected a lot of items you don’t use anymore. Declutter your home by throwing away these things. Dispose of any broken tools and busted kitchen appliances. Donate bags, books, shoes, clothes, and other belongings you rarely use. Throw away broken toys, torn magazines, old bills, dusty and moth-eaten books. You want the house to look spacious, but that won’t happen unless you take some stuff out. Decluttering gets rid of many items, but you’ll still be left with things you want to keep. Pack things you don’t need every day. Basically, you want to lessen the number of clothes and linens in your drawers and cabinets, so pack away your seasonal clothing. Keep your CD and DVD collection in a box, together with all those books and art materials your kids may need in the future. Don’t forget to include your mementos, photos, and wall decor! I know, you’ve heard of this a million times over, but I cannot stress it enough. When I say clean, I don’t just mean a good sweep or vacuum over the floor. The house must be thoroughly clean. It must be spotless, it must sparkle. Clean your cupboards, over the cupboards, cabinets, drawers, the bathrooms, the kitchen, the bedrooms, the walls, the baseboards, the windows, vents, everything! It takes time to clean a home, and it’s a continual process. I know I said you don’t have to spend anything for the preparatory steps, but if you don’t have enough time to clean, have a professional cleaning crew do it. They’ll do it so efficiently your house will literally sparkle. Many times I’ve heard buyers say “This home is so clean and well-maintained!” Buyers think that if you keep your CT shoreline home for sale clean, you also maintain the home well, which means the house is in great condition. The day you made the decision to sell is the day you start removing your identity from the house. This is what it means to depersonalize. You want to make your house for sale in Hartford CT to look as neutral as possible because a lot of buyers will be coming in and checking it. Start by removing anything religious, political, superstitious and personal in your home. Think of the model homes and expensive hotels you go to. You love the inviting feel, the cozy atmosphere, but you don’t see any huge photos of the owner in the suite. It’s the same thing when you sell a house. The potential buyers are not interested in seeing photos of your kids on the wall. They would have an easier time connecting to your property when your personal belongings are not on display. Fix leaky faucets, broken door knobs and locks, replace chipped or cracked tiles, cupboards that need repair, etc. You want to take care of all these little flaws because you don’t want the buyer to find a reason to complain or to ask for a lower price. Let’s take a look at the most commonly staged rooms when selling. 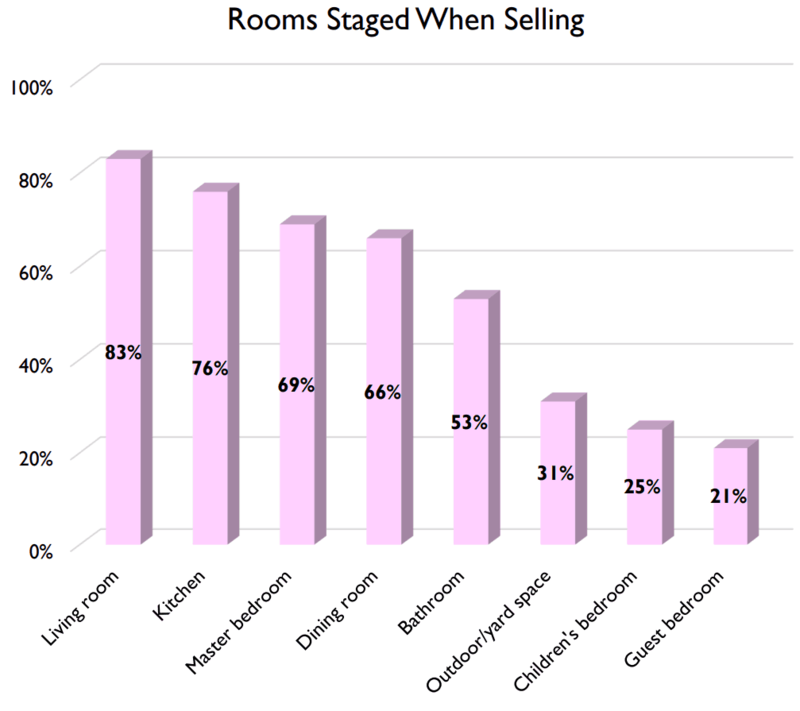 This data was taken from NAR 2017 Profile of Home Staging. Now that we’ve established how important it is to stage and what places to stage, let's watch this video on home staging from HGTV. Did you take notes? I hope you did. That way, you can start applying the shared staging tips in your Hartford CT house for sale. What Home Improvements and Quick Fixes Can Increase My Home’s Value? With the decision to list your CT luxury waterfront home comes the responsibility of ‘putting its best put forward’ so to speak to be more appealing to buyers. Home improvements, updates and quick fixes are also sure ways to get a good price for your home for sale, even to increase its value. Of course, it comes with a price. A major improvement can be expensive. What if you have a limited budget? You don’t need to put a hole in your pocket to make home improvements. Quick fixes and minor updates can do the trick! Here are the top 10 things you can improve or fix which will boost your home's worth. 1. Fix minor issues and repairs. Before you proceed with any aesthetic improvement, stick first with the most important repairs. Walk around the house and check for the different things that need repair or replacement. Broken windows, jammed doorknobs, broken tiles, moldy sidings, all these issues must first be addressed before proceeding to any home improvements. 2. Repaint it. Repainting your house, from the interior to the exterior, is one of the best ways you can improve your home’s look. It’s amazing how a couple coats of paint can modernize a home’s look, make it look bright and spacious and give the impression that it is well-maintained. It’s also cost-effective. Paint your Candlewood Lake CT home for sale in a neutral tone so that buyers can visualize the space as theirs. 3. Minor kitchen updates. The kitchen is the heart of the home and in today’s modern society, is one of the preferred hubs for entertaining. This is why a beautiful kitchen tops the must-have features of most buyers. Do a mini remodel. Make your kitchen more appealing by applying a fresh coat of paint to the cabinets, replacing all the hardware, updating your countertop and installing a backsplash. This can instantly lift the look of your kitchen without spending too much. 4. Update the bathroom. If there’s another room in the house (other than the kitchen) which must be fixed and updated, it is the bathroom. Its constant use makes it prone to wear and tear, so an upgrade is necessary. After ensuring that the bathroom is clean and grout free, repaint the bathroom cabinets and replace the hardware. Updating the light fixtures also improves the lighting and ambiance in the bathroom. 5. Create more space. If your home is one of those built 10-20 years ago where there’s a separate room for everything, knock down non-supporting walls to create more space. Buyers prefer the open floor plan for many reasons, one of which is it makes the interior look bright, airy and spacious. 6. Clean up the lawn. Make your Candlewood Lake luxury real estate property ook more inviting by trimming the lawn and the hedges, and removing toys, garden hoses, and any other items on the lawn. If you have trees on your front lawn, get professional help to cut the dead branches and trim the trees. 7. Make it light. Buyers want bright and airy homes. Let light in your house by opening the windows and installing new light fixtures. Select fixtures with a dimmer so you can control the amount of light in the room. 8. Energy efficient windows. Maximize your energy consumption by replacing your windows with energy efficient ones. It will benefit not just you but your buyers in the long run. 9. Outdoor retreat. Add square footage to your lakefront home in Candlewood Lake by installing an outdoor retreat. It makes a great spot for relaxation and entertaining. You don’t even have to spend that much. A wooden deck costs about $5,000 and you get a 75% ROI. 10. Update the front door. If you want a project with a big return, replace the front door. Steel doors have an ROI of 101.8% so you basically get back everything you spend and more. Buyers love new doors. Not only does it do wonders for your home’s curb appeal, it also impresses security and safety to the buyers. Before you jump to any upgrades or renovations, here are two things to remember. Don’t overdo it. Anything extensive or over-the-top is a big NO! Don’t over-renovate your home or add high-end appliances just to increase your selling price. Home upgrades should be done with the buyer’s preference in mind. Remember that no matter how many features and amenities you install in the house, it is still up to the buyer to decide how much he thinks your CT lakefront home is worth, so fix it up so it becomes more appealing to the buyer. Before we end, let's watch this short clip about the best three home improvements you can do for your home. And remember to consult with your real estate agent before doing any home improvements. How Much Does a Kitchen Remodel Add to the Value of My Home? One of the best updates which give the highest ROI is kitchen remodeling. Buyers prefer modern kitchens with quality appliances and ample storage, and they are willing to pay top dollar for a home with beautiful kitchen space. After all, kitchens are no longer just a room where you cook. In today’s modern lifestyle, the kitchen has become a space integral for daily living and entertaining. It has become one of the most frequented rooms in the house. The better-looking your kitchen is, the more use it will provide for you. Did you know that the kitchen is the most visited place during home showings and openings? Improving your kitchen will make it more appealing to buyers and ending it in a successful sale. Reports from previous years also contain the same information. The numbers have changed, but the results are consistent – minor home upgrades give you better value for your investment. What are some minor home upgrades you can do? To answer the question, it is best to look inside your Connecticut property for sale's kitchen with a fresh perspective. The last question is important because the quality of the update you’ll be making depends on how much you can afford. Repainting the kitchen cabinets. Painting is the cheapest improvement, and it makes a huge difference! A fresh coat or two will give you a brand-new look. Replacing all hardware. Over the years, you’ll notice the handles, knobs, and pulls are starting to look old and faded. Change all hardware, including the faucet. Replace lights. Buyers look for bright kitchens. Switch to new lights that illuminate the kitchen, making it look bigger and more spacious. Add a tile backsplash. Improve your kitchen’s visual aesthetic by adding a ceramic or tile backsplash. Follow these ideas and increase your kitchen’s value. How to Get My Home Ready for Last Minute Showing? At this stage, your waterfront home in Candlewood Lake CT is ready to sell. It has already been listed, and your Realtor® is heavily marketing your property online. Because it is listed, expect to get showings. They will come, and often at unexpected moments. Like that moment you decided you'll postpone laundry because you're feeling tired. Or when you decided to leave dirty dishes in the sink because your favorite movie is on TV. If you only have 30 minutes before prospective buyers arrive, what do you do? First, you have to remember that the house has been thoroughly cleaned, so you don't have to check for cobwebs in the corners. If you've followed my previous advice, the house would already have been cleaned, decluttered, painted, and staged. There would be very little to no personal items or decor displayed. Even the curb appeal should have been improved already. However, life continues on, so there would be the usual mess associated with living, like bills, books and magazines left of the countertop or table, unwashed dishes, garbage in the trash can, toys on the floor, and maybe some clothes or a pair of shoes left on the floor. With only 30 minutes to spare, can you pull off getting your home ready for a showing? Yes, you can! Here's a checklist of things that will make your home look like it's always show ready. Put all clutter away. Pick up any clothes, shoes, toys, pencils, etc… anything that's on the countertop, table or floor and put them in their proper places. Make sure your bills, books, magazines, remote control, electrical cords, and more, are in their designated places as well. It's amazing how putting household items in their right places can make a home look so much better. Sweep the floor. Remove any dirt on the floor by sweeping it. Buyers love clean homes. Take out the garbage and dispose it in the trash cash. Buyers love to explore cabinets and drawers. You don't want them discovering your kitchen trash. Remove all personal items inside the bathroom. Take out all personal items like soap, shampoo, makeup and more. Wipe the mirror and the countertop, and check for any trash you may have left inside. Make the beds. If the beds aren't made, you obviously have to prepare them so they'll look great when buyers come in and check the different bedrooms. Clean the dishes and put them all away. You don't want buyers to discover your dirty dishes and sponges. Put the laundry inside the machine so you don't have any laundry lying around. Open the windows to let fresh air in. Most homes have a distinct smell. You probably don't notice it, but if there's a whiff of anything unpleasant in the air, you can be sure the buyer is going to smell it. Letting in fresh air will help neutralize the smell. Avoid using air freshener sprays or plug ins. Turn on all the lights. Yes, even during daytime. You want every corner of the house to look nice and bright. Opening the windows and doors not only let in fresh air, it also allows plenty of natural light inside the house. Do a quick check and clean of the front yard and backyard. Step outside and check for any toys left on the porch. Check your front yard to see if there are any hoses, gloves, or raked left there. Do the same thing with your backyard. If you have any pets, make sure that the house is hair-free. Have a lint brush handy so you can easily wipe down furniture. Lastly, leave the house before your Realtor® and potential buyer arrives. You don't want to be around during the showing because it makes the buyers feel like they are intruding. Don't forget to take your pets with you. How to Negotiate like a Pro? We’ve reached the final chapter of How to sell your Connecticut home fast. At this stage, your home is now on the market, and with all the preparations you’ve done, it is received well. You have received several offers for your CT luxury waterfront house for sale. Most of the offers don’t match your listing price, so now you are preparing yourself for negotiation. As a home seller, you are under a lot of pressure to sell the home as quickly as possible. This does not mean you’ll simply agree to the offer given. How do you negotiate to get the price close to what you want? Is it possible for both negotiating parties to win? Here are my tips on how to negotiate like a pro. 1. Information is leverage. Buyers use information they’ve learned to get the price down to how much they are offering, so keep necessary information to yourself. They don’t need to know that you are moving out of the state in two days. They don’t need to know that you will start a new job in a different city next week. They don’t need to know that your debt is piling up, which is why you are selling the home. Knowing all this information will give them leverage over you, so be friendly, but not chatty. 2. Negotiate fairly and respectfully. Sometimes during negotiation, emotions run high. If you’ve received a low-ball offer, simply reject and move on. 3. Lessen stress by dealing with important issues first. One of the reasons sellers accept low offers is because of pressure from the mortgage company. If this is you, arrange a meeting with your lender and request for an extension. When you explain that you are already in the negotiating process, most financial institutions are willing to work with you. 4. Leave your ego at the door. Know what you want, and learn to meet the other party’s offer without getting cocky. An abrasive and cocky attitude will make it more difficult to sell your home. 5. Consider the buyer’s point of view. Be considerate and also think of where the buyer is coming from. For example, if you are haggling over $5,000, that money will be more helpful during closing. To the buyer, it will mean an additional hundred dollars over several months of payment. 6. Make a counteroffer. If you received an offer that is close to what you want, review it carefully and make a counteroffer. That way, you and the buyer will feel the offer is fair for everyone. Take time when negotiating. Remember that your luxury waterfront real estate in CT is one of the biggest financial transactions you’ll make in life. Do it properly and always consult with your real estate agent before accepting any offers. It is possible to sell your CT waterfront home fast and with less stress. Call me, Deborah Laemmerhirt, at 203-994-4297. Let me help you have a smooth and stress-free home selling journey.